CHARLESTON HARBOR: Where two 13,000-TEU vessels, the OOCL Poland and UASC Jebel Ali, recently met. Year-over-year container volume is up at the port of Charleston. The Port of Charleston handled 1.6 million TEUs during the first three quarters of its 2018 fiscal year. The South Carolina Ports Authority has announced the strongest monthly container volume in its history, with 199,659 twenty foot-equivalent container units (TEUs) handled in March. The month was nearly four percent higher than March 2017, which was the port’s previous record month for TEUs. Year-over-year container volume is up, and the port handled 1.6 million TEUs during the first three quarters of its 2018 fiscal year. As measured in pier containers, or boxes handled, SCPA moved a record 113,663 containers in March. The Port has handled 909,614 pier containers since July, a growth of 2 percent over the same fiscal period last year. 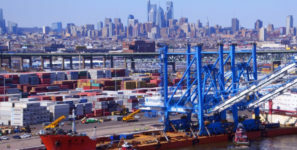 March also marked a record month for finished vehicles, with 28,391 vehicles moving across the docks of SCPA’s Columbus Street Terminal in March. Overall in the non-container cargo segment, the Port handled 80,683 breakbulk tons last month. Inland Port Greer handled 10,612 rail moves in March. The facility’s fiscal year-to-date volume is nearly three percent higher than last year, with 87,360 rail moves since July.